A mobile home and camping park. 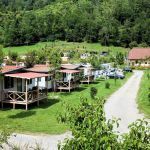 When you stay here you can bring your own tent or stay in one of the Bella Austria Mobile homes that can sleep up 6 people and park your motorbikes on your doorstep! 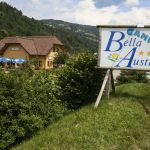 From here, the Red Bull racetrack is only a short ride away and there are many mountain roads to explore and beautiful lakes to find...or if your a town person, there are many wonderful Austrian towns and cities in the area. 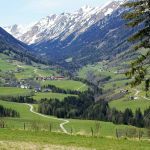 Within an enjoyable ride to Günstner Waterfalls, Enchanted Forest of Styria, Mines of Oberzeiring, Klagenfurt, the spa town of Bad Kleinkirccheim and awesome roads that include the Heiligenblut am Großglockner, Turracher Höhe Pass and the Sölk Pass. All Biker guests can enjoy the swimming pool, a sauna or simply relax at the bar in the campsite Bar and Restaurant. Reception, shop and laundry facilities. Free Wi-Fi. Private parking. Mention you found them on THE BIKER GUIDE* and get a free use of a saunas (two hour block) and a 6 pack from the local brewery per booking. *Must arrive on a Motorbike. 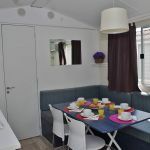 Biker Friendly Accommodation Austria, Erlenweg, Bad Ischl, Located in the heart of Salzburgerland, The village of Viehhofen, Biker Mania, spa town of Bad Ischl, right in the heart of the famous Salzkammergut region, Eurotherme. Austrian villages; Lake Wolfgang Strobl, St Gilgen and St Wolfgang Hallstatt, Salzburg, the home of Mozart. 'Sound of Music' tour, medieval town of Kitzbühel in the Austrian Tyrol, Urfahr-Umgebung in the upper Mühlviertel, near the state capital Linz. Close to various castles, including Linzer Schloss, Hartheim Castle Memorial Site and the State Castle - Chateau Èeský Krumlov in Czechia.